It was around this time last year, that our Landcare group with the help of a few extra volunteers removed a of huge raft of Water Hyacinth from the western side of Lake Ainsworth. Aquatic weeds weren’t part of our regular activities but we could see this free-floating plant growing at such a phenomenal rate, that the vision of it covering the lake entirely, drove us into the water - we pulled out truckloads of the stuff. So are we surprised at this years return of Water Hyacinth? Well.. not really, Water Hyacinth seed can ‘remain viable in the muddy soil for up to 20 years’ - and although we did our best to remove the Hyacinth before it set seed last year - chances are this plant is here to stay. What’s also unsurprising to us, albeit disturbing, is the rate at which Water Hyacinth spreads in our Lake. 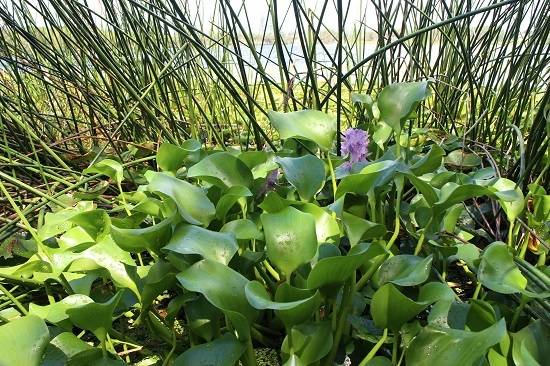 Research has shown that under ‘ideal conditions’, where waters are slow moving and nutrient rich, Water Hyacinth infestations can ‘double in size every 5 days’ - it does this by producing daughter plants. Unfortunately for us, this is about the rate of growth we’re observing at Lake Ainsworth. As well as observing the life of Hyacinth, we’ve been monitoring the Lakes nutrient levels (specifically phosphorus) as part of our Waterwatch program. We’ve been doing this since 2012 and like the many other studies that have been done on Lake Ainsworth, our results indicate that our Lake certainly fits into the nutrient enriched category*. Nutrients are basically food for plants and include anything containing the elements phosphorus and/or nitrogen - they are found in sediments, fertilisers, soaps, decaying plant material, faecal matter and urine. In a healthy natural aquatic ecosystem it’s the job of the riparian zone to capture and absorb nutrients before they enter the water body. When nutrients occur in excess in a water body they cause ‘nuisance aquatic plant growth and blue-green algae outbreaks’. Sounds all too familiar doesn’t it? Our current Water Hyacinth situation is not ideal and it serves to remind us that our lovely Lake isn’t really doing ok... and that if we want to continue to enjoy using the Lake into the future, then we need to do better. Lennox Head Landcare fully support the closure of the eastern road to carry out works to ‘improve the health and amenity of Lake Ainsworth’ and have done so ever since its recommendation in the 2005 Masterplan. * Phosphate levels for Lake Ainsworth well exceed the ANZECC trigger value for a healthy Lake.